In the accompanying leaflet to the British Library’s Propaganda: Power & Persuasion exhibition is the observation that, in this age of Twitter, blogs and social media – being carried in all of our pockets, and available to us at the press of a button or click of a mouse – anyone can be a propagandist. So, as a bona-fide blogger, I thought I’d give it shot. READ MY BLOG. MY BLOG IS ACCURATE, TRUSTWORTHY AND AUTHORITATIVE. READ MY BLOG. That should get the hits up. Of course, most propaganda is a good deal more sophisticated than that. Indeed, truly masterful propaganda is that that is not even noticed – that is to say that it is information taken completely at face value by the observer or audience without them thinking of it as being propaganda. It’s one of those curious phenomena, like special effects in a blockbuster movie, that the more subtle – even invisible – it is, the more effective it is. Naturally, therefore, there were a few items in the exhibition that, when I first saw them, I found myself somewhat surprised to see them. How can a video clip of the royal family’s Buckingham Palace balcony appearance during last year’s Jubilee celebrations (complete with harmless enough Philip Scofield commentary) be propaganda, I asked myself. Or an old black-and-white advertisement encouraging Britons to buy Australian wine – surely not? Clearly, then, I am just not cynical enough about either the British monarchy or the advertising industry to view these things as propaganda. Neither am I on the same level of cynicism as certain people who came to regard Danny Boyle’s 2012 Olympic Games opening ceremony (which also popped up in the exhibition) as one giant piece of Marxist propaganda. I, for one, thought Boyle’s spectacle was nothing less than a triumph, a richly enjoyable and thoroughly uplifting picture of Britain and Britishness. Indeed, to borrow Alistair Campbell’s phrase, a superb piece of ‘country branding’. And while I therefore cannot help but fiercely disagree with what we might call the ‘Marxist interpretation’, even I concede that Boyle was selective in his portrayal of British history. But then again, whether Boyle is a Marxist or not, or whether someone else had been in charge of the ceremony or not, something like this was always going to be selective. How could a theatrical take on an a nation’s entire history and culture ever not be so? Perhaps George Orwell is right when he says ‘all art is propaganda’. Oh hell, maybe even [1950s French political theorist] Jacques Driencourt is bang on the money by saying ‘everything is propaganda’! What this exhibition really rams home – whether you agree with Orwell or Driencourt or not – is that propaganda is all around us. There is material here from the obscure to the very familiar, from the historical to the topical. Clearly you don’t have to be living in a totalitarian state to find yourself both a target of it, or perhaps even taking part in it in some way yourself. I warn those of you who visit this exhibition: you may never look at your friends with jobs in PR or advertising in quite the same way again. As well as this central ‘what is propaganda?’ question, the exhibition also has us asking ourselves whether propaganda is a good thing or a bad thing. It seems, in the twentieth century at least – the ‘golden age’ of propaganda in many respects – propaganda became a bad word, becoming inextricably associated with totalitarian regimes and, ultimately, with evil. Ask any person on the street what they think propaganda is and they will probably respond with sinister words like ‘brainwashing’, ‘thought control’ or plain and simple ‘lies’. But what might have happened to the morale of the British people during the dark days of the Blitz had the government’s propagandists not been working tirelessly to send out messages of reassurance to the masses? Whether it was telling people to grow their own vegetables, being selective with the facts about British losses in combat or comically lampooning Hitler and the Nazis, this was propaganda that was all a force for good, right? 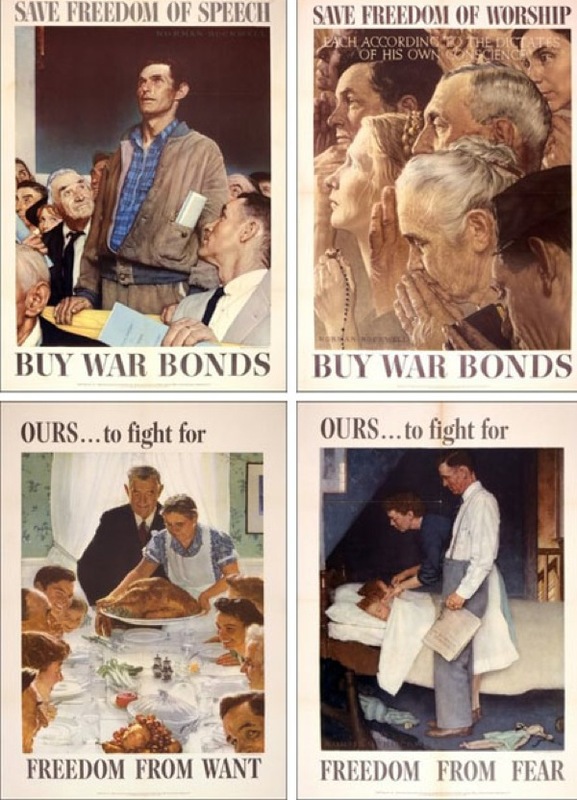 Of course the problem with wartime propaganda is, it is all-too-easy to view the side that you are on as having all the ‘force for good’ propaganda while your enemies’ churn out all the nasty, brainwashing lies. Equally, history has a tendency to make a similar good/bad propaganda distinction between the side that wins a war and a side that loses. You only have to see some of the racist anti-Japanese material produced by the British government during the second world war, or the humourous German films poking fun at Churchill and the British to realise that in any war, both sides are employing just the same tactics. If there is one example of where it is hard to argue that propaganda can be a genuine force for good then it is when it comes to public health campaigns, which the closing section of the exhibition focuses on. This serves as a nice twist in the tale, for after being bombarded with all the nationalism and the war cries it dawns on you that exactly the same propaganda techniques are being using in the material telling people to exercise more, always wear a seatbelt or remember to sneeze into a handkerchief. As the do-it-yourself guide to making effective propaganda in the exhibition leaflet attests, these public health campaigns tick all of the boxes. Establish authority; Exploit existing beliefs; Create fear; Hammer it home, etc. 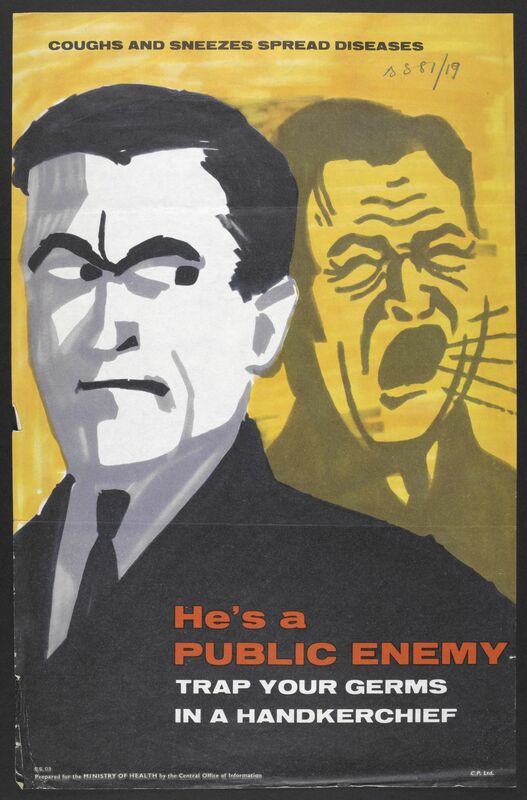 The Ministry of Health’s ‘public enemy’ poster from 1960, depicting the man who sneezes without a handkerchief as a disease-spreading menace, gave birth to the phrase ‘coughs and sneezes spread diseases’ and helped to raise awareness of a very simple solution to a very serious problem, and probably saved lives as a result. 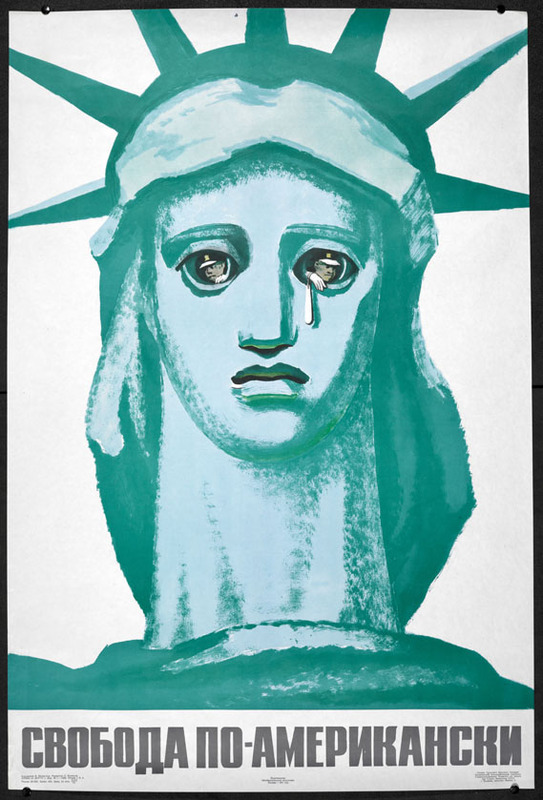 And yet it stands as a classic example of an ‘enemy within’ propaganda campaign, taken to extreme levels by the Nazis. The section devoted to ‘the enemy within’ is, unsurprisingly, dominated by antisemitic material from Nazi Germany, and while much of it will be familiar to many, it is still worth a good look. There are some interesting video interviews with experts on the subject that discuss the Nazis’ demonisation of the Jews in a broad context. How, for instance, the propaganda differed between within the Reich to inside the newly-occupied countries (where Joseph Goebbels’ propaganda machine had considerably less time to kick into gear and get the full attention of its new audience). And how, relatively speaking, the propaganda aimed at the Nazis’ other ‘enemies within’, such as the Catholic Church, was much less effective and its campaign ultimately short-lived. Most shocking of all the material here is a public information film about how to detect Jews who were able to make themselves appear alarmingly non-Jewish and blend almost seamlessly into society – almost as though they were as human as you or I. Disturbing as it was to consider, I could not help but wonder how my own thoughts and perceptions may have been coloured or altered had I been living in Germany at the time and been witnessing material like this every time I went to the cinema, for a period of more than ten years. Goebbels once said that ‘It may be a good thing to possess power that rests on arms. But it is better and more lasting to win the heart of a people.’ It is little wonder that propaganda has got such a bad reputation. On the whole I enjoyed the way that the exhibition challenged my perceptions and made me ask myself what I think propaganda is. However I would have liked to have seen more material from before the twentieth century, especially given that the word ‘propaganda’ originated in the early seventeenth century, with the Catholic Church’s establishment of a body called the Congregatio de Propaganda Fide or ‘Congregation for Propagating the Faith’, responsable for carrying out missionary work. While it was not until the first World War that governments set about creating their own departments and ministries dedicated to producing propaganda (the British government’s Enemy Propaganda Department were the first), for as long as there have been powerful people in the world there have been powerful people using propaganda in some way or another. Just ask Napoleon, whose enormous coronation portrait stares down at you from the wall. By the way, all of the quotes I have used so far in this blog came from a series of slightly creepy-looking mannequins that stand in line at the exhibition’s entrance – you walk through them like they await your inspection – with the words of philosophers, politicians, writers and other thinkers projected onto them. My favourite of all the quotes about propaganda I saw here was by the brilliant Bertrand Russell, who once wrote, ‘The propagandist is a man who canalises an already existing stream. In a land where there is no water, he digs in vain.’ For me, it cuts right to the heart of what propaganda is. For propaganda ultimately can only work when it plays upon the indented audience’s already-held beliefs or assumptions – that is, their pre-established ‘truths’. Even in its most grotesque and outrageous forms, propaganda merely exploits pre-existing prejudices. Propaganda: Power & Persuasion runs at the British Library on Euston Road (next to St Pancras International Station) until 17th September 2013. Tickets are priced at £9 for adults, whilst under-18s go free. Why not whet your appetite for this fascinating exhibition with this little video all about defining propaganda? YOU KNOW YOU WANT TO. Tags: 17th century, advertising, American, antisemitic, authority, Bertrand Russell, brainwashing, Britain, British Library, Catholic Church, coronation, culture, Danny Boyle, exhibition reviews london, exhibitions london, Four Freedoms, George Orwell, Germany, government, Jacques Driencourt, Jews, Joseph Goebbels, Napoleon, Nazi, Norman Rockwell, Olympic Games, persuasion, philosophers, politicians, poster, power, PR, propaganda, thought control, totalitarianism, war, Winston Churchill, World War One, World War Two. Bookmark the permalink.